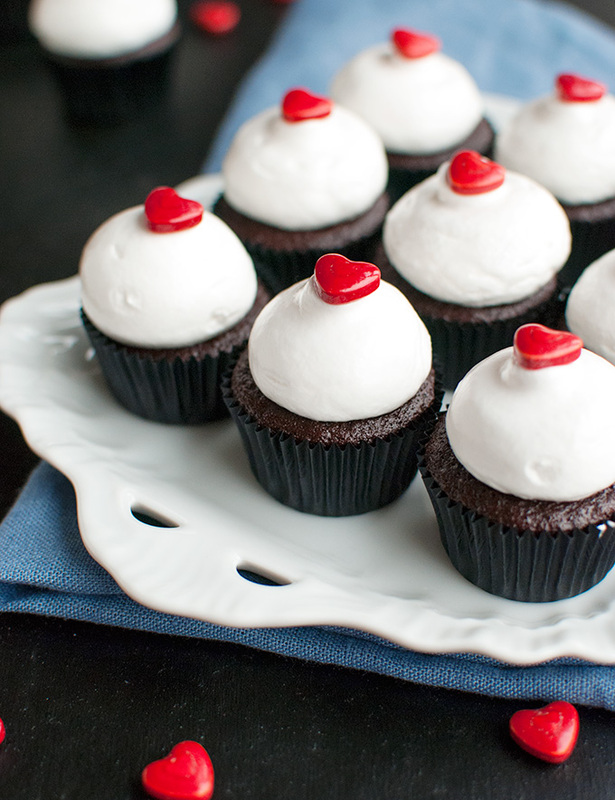 Perfect for Valentine’s Day: Mini Chocolate Cupcakes with Meringue & Raspberry. 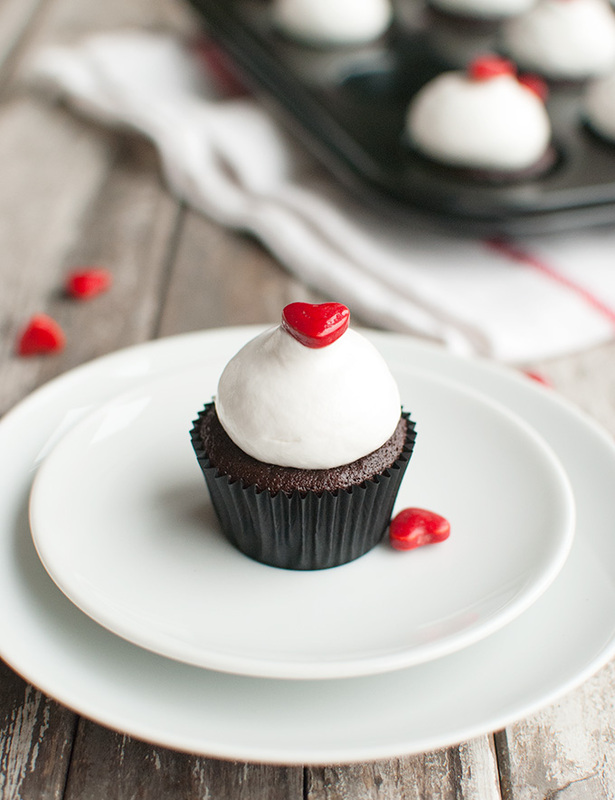 The BEST dark chocolate mini cupcakes ever, topped with the fluffiest Swiss meringue and a cute little heart, and filled with tangy raspberry jam. Yum! Yup. Did it. I made something cutesy. Even though I’m not really that good at making cutesy things, or especially care for cutesy things. 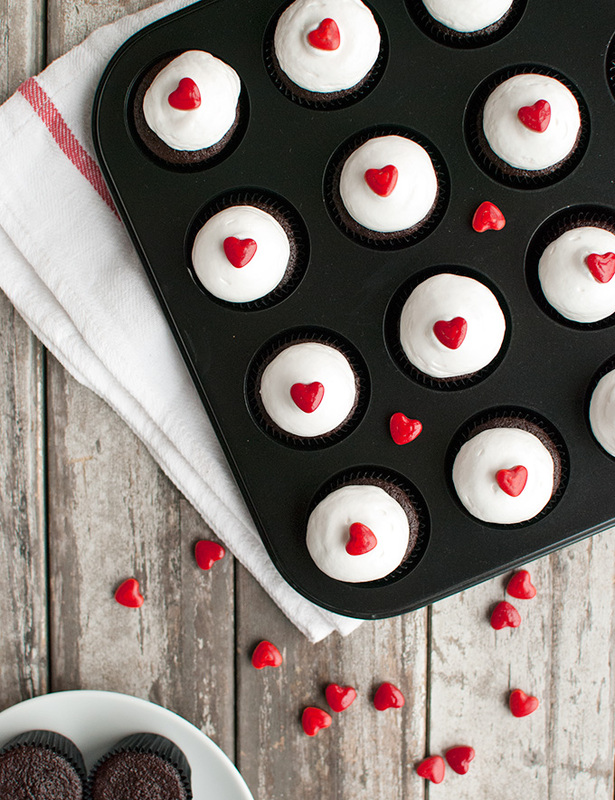 But there’s no denying it, these cupcakes are just that: cuuuuute! First of all, these cupcakes are MINI cupcakes, which makes them cute by default. Like those little travel toothbrushes. Then there’s that cute heart-shaped mega sprinkle on top. More cuteness there. All for love! Well, for Valentine’s Day, at least. The Rocking Rebel actually picked the sprinkle off before he ate his cupcake. He just isn’t such a fan of sprinkles… Chocolate, on the other hand, is his thing, and there’s more than enough chocolate in these little cakes! Wait, did I mention ‘chocolate’? Oh awww right, let’s first quickly address THE recipe. The one you’ve all been waiting for (right? ): my recipe for healthy chocolate frosting. So. I experimented with a bunch of different recipes, tweaked them, made them again, tried different ingredients, and in the end I came to the conclusion, that no, it can’t be done. It’s impossible. 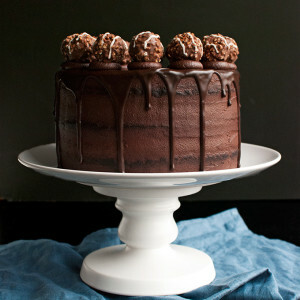 Healthy chocolate frosting = yucky chocolate frosting. 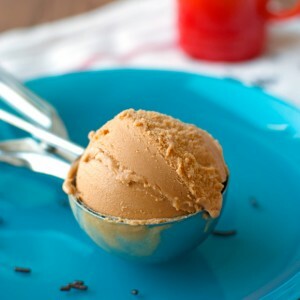 Okay fine, in some cases not even yucky, but definitely not imma-dunk-my-head-in-that-bowl-of-frosting delicious. And if a recipe is not that super special kind of delicious (↑), it has no place on my blog. So there. No healthy chocolate frosting. More about that later. And about how this whole blogging this has been working out for me in January. I’ve got a post coming up in which I’ll tell you all about it. 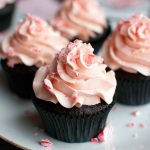 For now, let’s focus on these delicious lets-see-how-many-of-these-fit-into-my-mouth cupcakes instead! First of all, there’s that super chocolatey mini cupcake. Which is so good! 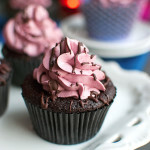 Have you tried my awesome recipe for Chocolate Cupcakes? 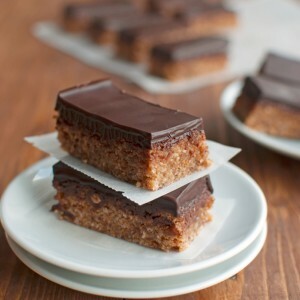 If you haven’t, you’ve been missing out, and you should put it on your to-bake list right away. If you have, you know just how awesome they are. And easy to make, too. The recipe for these minis is very similar and just as easy. You don’t need a mixer, just a whisk, and there’s a lot of Dutch-processed cocoa powder involved for the best chocolate flavor. No light brown sugar, though. I do use it in my recipe for regular-sized chocolate cupcakes, but I found that it gave these minis a chewy top, which I didn’t like. So I only use white sugar in this recipe, which makes them soft and tender and fluffy and perfect. Then there’s meringue. Swiss meringue, which you can pasteurize, so everyone can have one of these, even your pregnant friend and elderly neighbor and baby son. 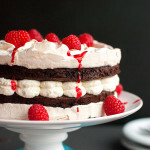 I love, love, love meringue. Especially straight out of the bowl, when it’s still a bit warm. It dries out when it sits too long, which is why these cupcakes are best served the day you made them. And to cut through all that sweetness, there’s tangy raspberry jam. It’s the secret ingredient. 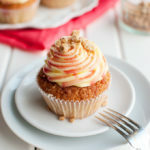 The one that takes these cupcakes from ‘indeed very good’ to ‘delicious’! The only thing that would have made these cupcakes even better would have been a dunk in a pool of molten dark chocolate, because let’s be honest, that would improve almost everything. But the dunking in chocolate part it messy and time consuming and I had things to do, so I just left them meringue-y. And scroll down for a nice pin! 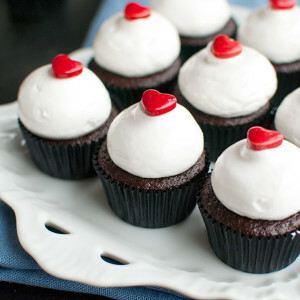 Dark chocolate mini cupcakes, topped with the fluffiest Swiss meringue, and filled with raspberry jam. Makes 24. In a medium-sized, heatproof bowl, and using a rubber spatula, stir together the egg whites and sugar. Place the bowl over a small pan with simmering water, making sure the water doesn't touch the bowl. Keep stirring the mixture (scraping the sides of the bowl as you go) until the sugar has dissolved. You can easily check whether the sugar has dissolved by rubbing a bit of the mixture between your fingers; the mixture shouldn't feel grainy. If you're not worried about salmonella, you can take the mixture off the heat at this point. If you want to pasteurize the meringue, keep whisking until the mixture reaches a temperature of 71°C/160°F. Once the meringue reaches the desired temperature, take it off the heat. Using a hand held or a stand mixer, beat the warm mixture until the meringue holds the desired peak (soft, medium or stiff) and has cooled to room temperature. Combine the jam with a teaspoon of water in a small saucepan and place over low heat. Heat, stirring continuously, until combined and the jam is runny. Transfer runny jam to a small piping bag and allow to cool for a few minutes. Using a chopstick, poke a hole in the middle of each cupcake, wiggle the chopstick around to widen the hole, then snip a tiny bit off the end of the piping bag and fill each cupcake with a squeeze of jam. Fill a larger piping bag fitted with an large open tip with meringue. 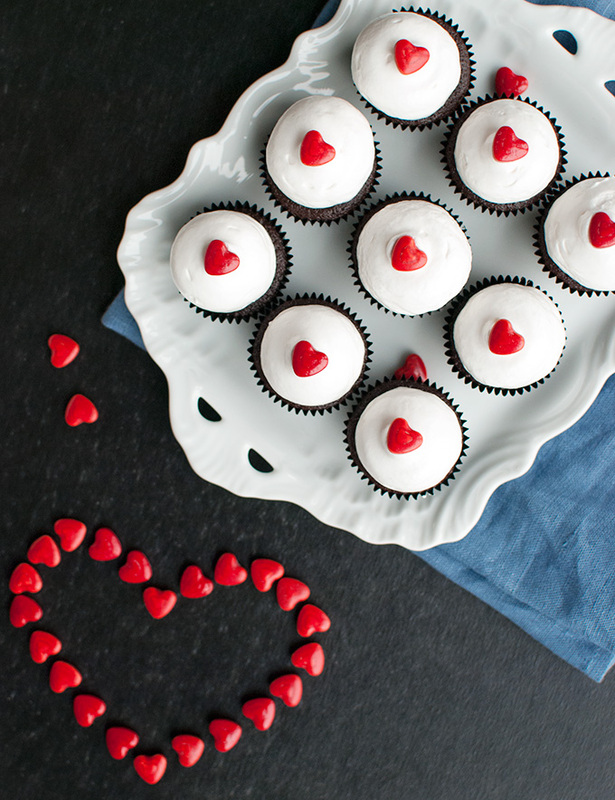 Decorate each mini cupcake with a large blob of meringue and top with a sugar heart. Cupcakes are best served right away or a few hours after you made them, but they are also very good the day after. Store in an airtight container in the fridge.